Just as many of us neglect to read the terms and conditions of a product or service before agreeing and signing our lives away, app permissions requested upon an app’s installation are often overlooked. As we’ve seen before, though, some developers take this as an opportunity to abuse their position and siphon off information that they’ve otherwise no business collecting, and an intriguing new chart reminds us once more that it pays to err on the side of caution. Let’s face it, checking app permissions for every single download is a bit of a taxing rigmarole, and if, like us, you’re a power downloader of apps, you may find the process gets more tedious with time. But when, say, a simple torch app demands access to features like your contacts and text messages, then it should strike a chord that something’s afoot, and as per some new findings by Vocativ, which analyzed 25 of the most popular Play Store apps, the amount of data these developers can pull is rather alarming indeed. It’s not surprising, but it is shocking that so many apps can pick up on data without the definite knowledge of the user. One major offender, Vocativ notes, is a simple kids game called Happy Fish, which despite seeming an innocuous title, can actually snoop through photos, texts, location details and even Wi-Fi. On the one hand, it’s quite easy to point the finger at the devs, in Happy Fish’s case, HappyElements, for taking advantage of consumers. Such info, after all, could be invaluable to advertisers and product marketers, and just by knowing key info about Happy Fish users, HappyElements could make a lot of additional money from questionably-sourced data. With that said, there’s a lingering feeling that mobile users don’t feel a sense of responsibility for how they use their mobile devices, and more importantly, how their kids use them. The in-app purchase scandal, which saw some parents charged thousands as their youngsters readily stocked up on e-coins, was a prime example, and while the likes of HappyElements are definitely taking advantage, the blame must also be placed on the consumer agreeing to the permissions in the first place. 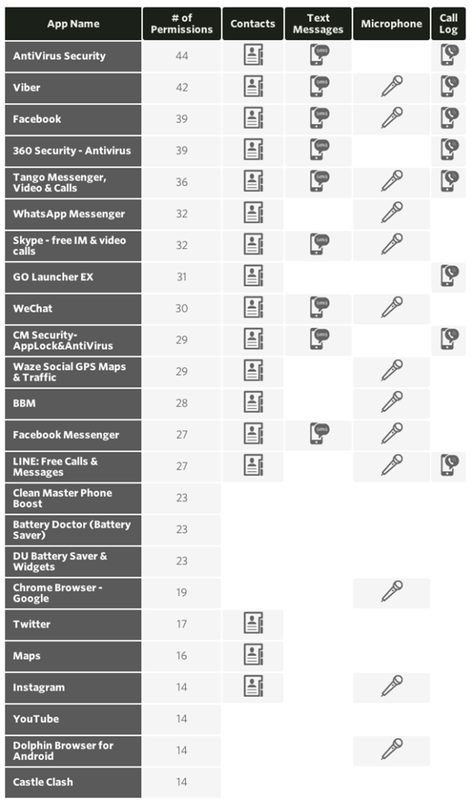 Most of the apps highlighted in the chart appear to have legit reasons for requiring dozens of permissions. 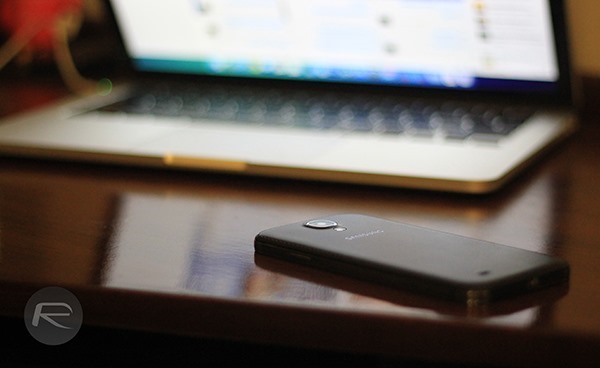 Antivirus Security, for example, needs 44 permissions, but in order to adequately protect an Android user from impending threats, such in-depth access is a necessity. Check out the illustration below, and before you install anything on your Android, always take that extra minute or two to run through the permissions if you value your privacy. I think its just android shows, iOS doesn’t..
iOS handles permissions differently. You have the option to revoke specific permissions from an app, and when (and only when) an app wants permission for something, a pop-up will appear. This way you can install an app without granting permission for everything and you can even have apps like skype run without every having permission for your microphone or camera if you so want. It is a much better system, from a company that doesn’t profit from selling your private data. Ye, like the way you have the control in iOS. I own an iPad and Mac, i used to have an iPhone. I love the way android allows user to use his phone completely. Whereas iPhone doesnt. I hate the way apple tries to control customers. 1. Why the hell do I need to pay $300 or whatever to get my battery replaced. I am not talking about backdoor methods of eBay or so. 2. Why do I need to pay apple for expanding storage. Why can’t I put my own SD card. And recently, apple made the worst move of upgrading storage for all versions for free except 16 GB. The reason for this is, sales tactics. If they upgraded to 32, most people stop going for 64. Now people would think about it because 16 to 64 is vast difference for 100$. Did you see recent lawsuit against apple saying they are consuming storage. 3. Why can’t I access my file system and copy media. Why the f do I need to use iTunes? These are simple things that matter most for people. The flexibility that android offers over iOS is incomparable. One reason that I vote for Apple is hardware. Software and others is the worst. If you say this is hating apple, yes I am an APPLE HATER.